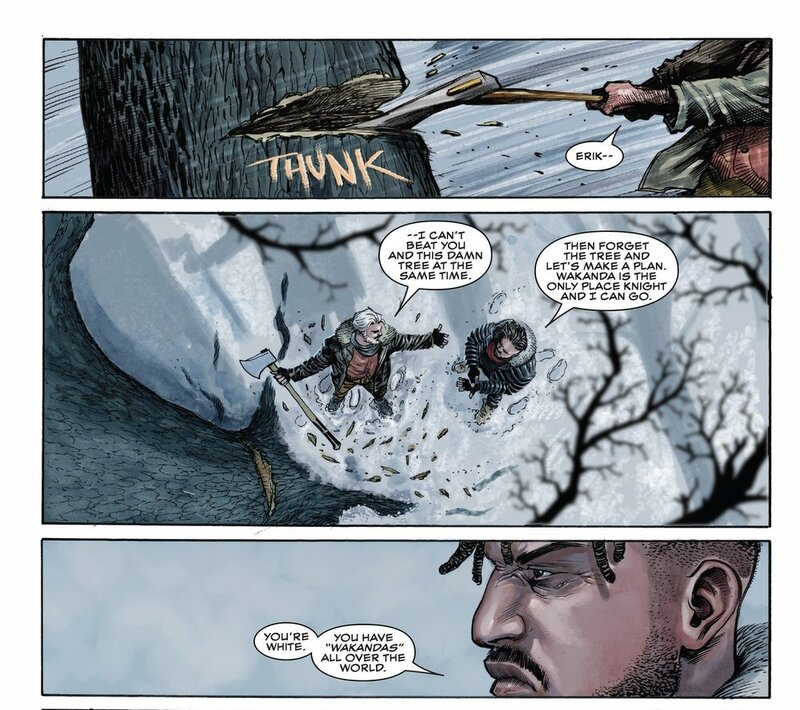 Killmonger “By Any Means” Part Four of Five is written by Bryan Hill with art by Juan Ferreyra and lettering by Joe Sabino. Taking place before Erik Killmonger’s return to Wakanda, this limited run series finds the Black Panther villain working with a team of contract killers hired by the Kingpin to carry out a number of assassinations. Killing is already second nature to the orphaned Wakandan taken as a child, stripped of his birth-name ‘N’Jadaka’, and raised as a mercenary by Ulysses Klaue aka Klaw - the racist, thieving, supervillain who murdered Killmonger’s parents during an invasion of Wakanda. Now seeking revenge, Killmonger learns that the only way to kill Klaw is to kill for the Kingpin whose own self interest involves keeping Klaw alive. Knight, Killmonger’s teammate in murder, new love interest, and “Queen” decides to throw everyone under the bus in an effort to cooperate with special law enforcement agency S.H.E.I.L.D. and leave her life as a mercenary behind at all costs. Killmonger is determined to help his new partner without destroying the life of King, leader of their gang of cool killers (and a silver fox zaddy depending on who you ask). With the crew disbanded and in hiding from the Kingpin who signaled the end of their business relationship by killing Rook (whose self healing powers seem to stop short of regrowing his own head), Killmonger & Knight travel to King’s cozy hideout in the snowy mountains of a distant land to warn him of new dangers. Writer Bryan Hill offers a young and justifiably angry Killmonger with the confident merciless swagger of the character’s big screen adaptation while adding a capacity for loyalty and consideration that we haven’t seen before. This series and the relationships within it might benefit from a longer run, but Hill does a solid job of utilizing honesty over circumstance as a tool for substantiating the connections Killmonger chooses to make. As head of the Kingpin’s hired band of mercenaries, King has treated Killmonger like a son in the short time they’ve known one another. While Killmonger doesn’t hesitate to point out King’s white privilege, he will defend and protect his paternal friend as best as he can. Hill’s writing allows Killmonger another human connection when he recognizes a shared trauma and haunting in Knight, the woman on the team (and possibly the most skilled mercenary) who understands that life is hard and killing is just business. All the makings of a #blacklove story as far as Killmonger is concerned. Two lovers, relating to one another’s hurt and desperation, making promises that they can’t keep because when you’re “ride or die” somebody always dies. Watching the deadly fun of people who are wonderfully terrible for each other, should be a reminder to stay away from toxic relationships in real life. 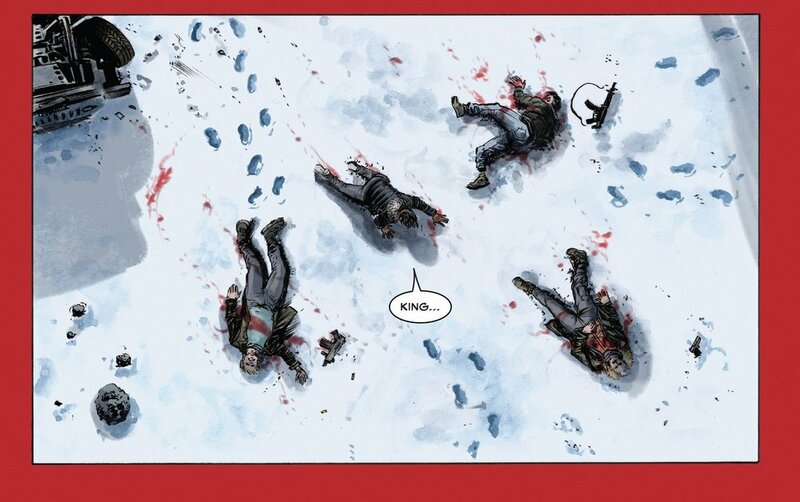 As somewhat anticipated, several things go to absolute sh*t during Killmonger and Knight’s Bonnie & Clyde/#relationshipgoals visit to the winter mountains of a foreign country to warn King of his potentially deadly status as a target of S.H.E.I.L.D.. Artist Ferreyra illustrates the fear, the anger, and the entire exchange beautifully. Killmonger starts this series with a desire to kill Klaw & return to Wakanda to take over the throne and seek revenge on the country and community who he believes abandoned him. Up until this point the few entities that he has allowed close to him - King, Knight, and his spiritual guide Mother Bast (appearing in previous issues in majestic purple hues reminiscent of the Black Panther films ancestral plane) - have encouraged Killmonger to chill on the intense hatred and seek the rewards of a life without revenge. If Killmonger was entertaining any possibility of utilizing a gentler approach in avenging his parents and the loss of his childhood, issue #4 shows Killmonger’s turning point to a man whose present day life affirms that the world and it’s people are violently flawed, self serving and deserving of whatever violent justice he seeks.